"MDC Lions Diabetes Awareness Fund Raising Project for Traveling Diabetes Resource Program Van Support"
MDC Lions Cavalcade for Diabetes Awareness Annual Camp out, and BBQ will be held in Cowley, Alberta at the Castle River Rodeo Grounds and Stockade on the date shown below*. More information will be sent to your club by mail or emailed to your club and will be available on this website. We look forward to seeing you at this event. 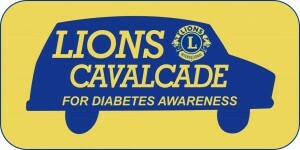 The MDC Lions Cavalcade for Diabetes Awareness committee has been raising funds to support Diabetes Canada awareness programs for over 25 years. The annual MDC Lions Cavalcade for Diabetes Awareness Campout, and BBQ was held in Millet, Alberta on June 15 - 17, 2018 and we thank the Millet Lions club for an excellent job of hosting the event. We are looking for a Lions club that would be interested in hosting this event for the 2020 Lions year and beyond. Contact the MDC Chairperson at pdg37e@sunraybase.ca for further information if your club is interested.